It was about couple of years ago when I was experiencing forex trading with no deposit bonus offered by the forex brokers to attract new clients, one of my cousin brother Bodrul Islam was talking with me about a no deposit bonus offered by a forex broker. During the discussion, he told me some of the key trading conditions to trade the bonus. One of the conditions was that the trader cannot apply Martingale trading strategy while trading on the no deposit bonus account. It was first time, I heard the key words "Martingale Trading Strategy". Martingale trading strategy was first introduced by French mathematician Paul Pierre Levy, later an American mathematician named Joseph Leo Doob worked a lot on this trading strategy. 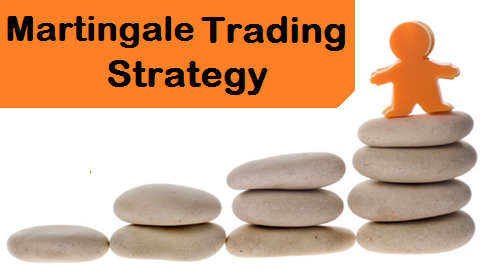 Martingale Strategy is primarily a betting strategy based on probability. However, in financial trading the strategy can be effectively applied to minimize risk and loss and to maximize profit. In forex trading martingale trading strategy is mainly applied to deal the losing trades, but it can also be applied to maximize profit from winning trades. In this post, I am going to talk about applying martingale trading strategy to deal with the losing trades. Let see how martingale trading strategy works. The price chart presented above is a daily chart of eur/usd currency pair, and we are going to apply martingale trading strategy to trade the pair. Assume, we placed a sell order at 1.11000 on eur/usd currency pair, we placed it to make profit not to apply martingale trading strategy. Unfortunately, the price started to move up, and we had a losing trade. In such situations, traders can take one of the three steps such as place a buy order, close the losing order, or apply martingale trading strategy. Let see how we can apply martingale trading strategy. As I said earlier, say we placed a sell order on eur/usd currency pair at 1.11000 to make profit, and our order size was 1 standard lot. At this point we have no loss. Now unfortunately the price moved up to 1.11500 and we were with a losing trades. Our loss was 50 pips or $500. Now we thought the market will go down and we decided to apply martingale trading strategy. We placed an sell order at 1.11500, and our order size was 2 standard lots. Mentionable, according to martingale trading strategy, the order size should be double of the previous order size. Again market moved against us and reached to 1.12000, and our total loss was 200 pips. We decided to go short again and placed a sell order on the pair. Our order size was 4 standard lots. Our third order is already placed and we are still in loss. Our luck was not good that time and the pair moved to 1.12500. We decided to sell 8 standard lots on the pair. 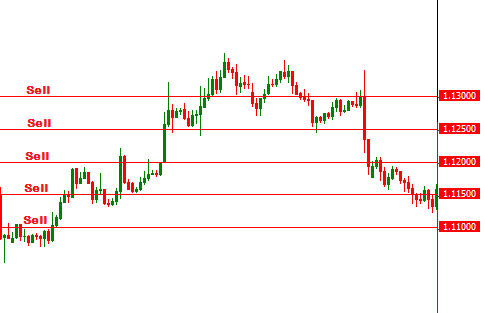 At 1.12500 price level, our total loss was 450 pips. Pressure was going up, market was trending, and no reversal took place, market moved to kiss 1.13000 price level. We decided to go short again with 16 standard lots order size. At this point we had a loss of 950 pips. However finally the pair touched the breakeven point and we were able to release the order at 0 loss. These are the steps how the martingale trading strategy is applied in forex trading while the market moves against you. While dealing with losing trades, application of martingale strategy lower the average order price, in this post I mentioned the average order price as break even price because when market reaches the average price the profit/loss is zero. It should not be applied on a trending market. The order size should be chosen logically with proper risk management. Every order should be placed performing market analysis. Not more than five orders should be placed by short term traders.